Published in the South Kent Gazette, 17 October, 1979. Chapel Street, which has now disappeared, was also one of the lanes. 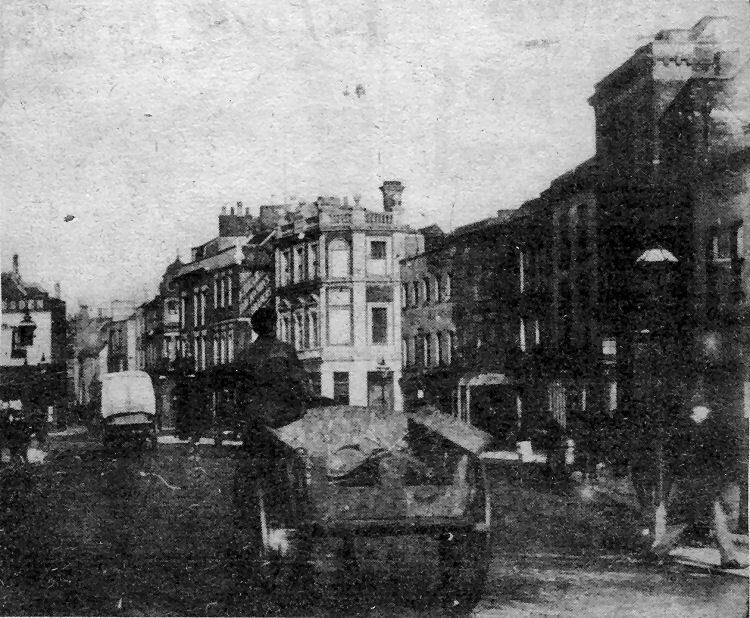 It entered Snargate Street opposite where the "Wellington Inn" stood. Before the extension of the town wall and the building of Snar Gate in the year 1370, the town wall took a north-westerly direction from this point, the foundations of the wall having been found under the old “Dover Express“ office, therefore Chapel Street, which was the commencement of the highway formerly called “Upwall,“ ran just inside the original town wall, and a considerable quantity of ancient stone was to be found built in the back premises themselves. A few yards from what used to be the top of Chapel Street is another opening to Snargate Street from Adrian Street, called Five Post Lane. It is a thoroughfare not wide enough for ordinary vehicles, but was sufficiently wide to admit cattle and hand-barrows, therefore, to exclude these, and to reserve its use for pedestrians, there were at one time five posts erected — hence its name. In the early part of the present century a house at the corner was the residence of Dr Sankey, a man of light and leading in his day. In the year 1341, Dr Sankey having built himself a new residence at Camden Crescent, his house was sold, and the lands adjoining, extending up Adrian Street, were sold in building plots, so that the south side of Five Post Lane dated from 1841. A popular feature on the eastern Snargate Street corner of the lane for many years was the "Trocadero Bars" public house. Next door, in Snargate Street, was a bookmakers, then adjoining the former Dover Express printing works and offices was Worrall’s cafe. These all disappeared when the York Street dual-carriageway was carried through to New Bridge. In the year 1835, on the western side of the lane, the sale rooms of Messrs Hellier occupied the whole of the premises (now demolished) marked by a red brick front in Snargate Street, supported by Corinthian columns. Mr Hellier was a man of original ideas, and he associated his sales of all sorts of goods with promenade concerts on those extensive premises. His establishment monopolised the greater part of Five Post Lane, but the top comer, in the year 1837, was occupied by Mr W. Binfleld as a grocer’s shop. Pear Tree Lane was a continuation of the Five Post Lane thoroughfare into that part of Chapel Place which was anciently named “Above-wall.“ On the east side the use of materials from the old town wall was quite obvious in the abutment of what was formerly Mr Carrier’s china and earthenware store. There is nothing else of historic note in connection with this lane except its name, which was derived from a pear tree which flourished there. There is a shred of old Dover, under the glacis of the Western Heights, which in ancient documents is referred to as “Above Wall.“ The area so described has varied in extent at different times, both by the growth of the extra-mural fringe, and by the shifting of the wall itself; but the whole of the town lying outside the original wall at this point, even when enclosed by a later wall, continued to be called “Above Wall.“ It will be convenient to deal with the whole area here, although the upper fringe was always outside the wall. That district now includes the greater part of Adrian Street, Chapel Place, Albion Place, Adrian Row, Albany Flats, Albany Place and Battle of Britain homes. The neighbourhood is not one in which there are mansions or public buildings of much importance, nor has it figured largely in ancient history; but it is an essential part of old Dover which will repay investigation. Mediaeval Dover seems to have been divided into four quarters — the military quarters on the Castle Hill; the fishermen’s quarter under the Castle Cliff; the Ecclesiastical quarter around St Martin-le-Grand; and the commercial quarter on the slope south of Queen Street, the upper part being the “Above Wall“ area which we are now describing. It is easy to see why there was an inhabited area “above wall.“ Room for expansion was needed in the industrial quarter, and dwellings had to be built outside the wall. As the sea receded from the cliffs, the lower part of the industrial quarter began to enjoy an undercliff which afforded room for expansion in that direction. Then a portion of Snargate Street was formed, and the wall, which had terminated in that direction, opposite the end of Last Lane, was carried further south-west to where Snar Gate was built in AD 1370. From thence, the wall was carried up the cliff, nearer the Heights than the old wall, and led across to Cow Gate, enclosing the dwellings which had previously been above the wall. Still the industrial population extended their habitations on the rising ground, so that there came to be a district called “Above Wall“ on each side of the wall built in 1370. Between the more ancient boundary and the later one ran a King’s Highway, which, from time to time, has been diverted and changed in name. Until the York Street dual carriageway was built, changing the character of the area, this highway took the form of a crooked thoroughfare starting out of Snargate Street just above the old “Express“ office. Its first portion called Chapel Street, a little further on, turning south-west, it merged into Adrian Street; and then, taking a turn to the north by the Mission Hall, became Chapel Place, extending to the top of Queen Street by Cow Gate. In earlier days, before it was diverted by buildings, this high road was more direct, passing the south end of Last Lane, and keeping between the new and the old wall, leading through Cow Gate to York Street (anciently called the Priory Lane), and on to Dover Priory. Few if any of the buildings now existing “Above Wall“ show signs of being ancient although the "New Mogul" public house, the only property of any age among the three properties left in Chapel Place, has rear walls of flint suggesting a structure of some antiquity. The Paving Commissioners, in 1834, proposed to improve this district by pulling down the west side of Five Post Lane, and carrying a street from thence on the upper side of Adrian Street Chapel into Hartley’s meadows, with the intention of making a through communication direct to Folkestone Road. That idea was put into the schedule of the Improvement Bill, but it advanced no further. Horse and carts and handcarts for delivering milk which was ladled out of a milk churn — these were a common sight in the Market Square area when this picture was taken in the early 1890s from King Street looking towards Igglesden and Graves, the bakers (now Weavers the stationers). In the centre of the picture are the premises of Killick, Back and Sons, the drapers, and Binfield Bros., the wine merchants. The covered horse and cart was probably heading for Hogben’s Fodder Stores in Church Street. The picture is a copy of a lantern slide lent by Mr Thomas Bailey, of Queen’s Rise, Ringwould, who also has slides of the old Dover lifeboat of the same period passing through Dover in procession, possibly in Regatta Week. A similar picture in part 13 of this Dover reprint prompted Mr Bailey to bring a selection of his slides to our offices.